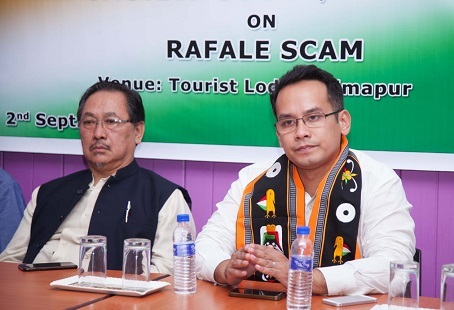 Congress MP from Kaliabor in Assam Gaurav Gogoi on Sunday said the “unilateral decision” of Prime Minister Narendra Modi to buy 36 Rafale fighter aircrafts from France at an inflated rate and without proper assessment and following procedure was betrayal of the trust reposed on him by the people of the country. Addressing a press conference here, Gaurav alleged the Prime Minister’s personal involvement in the Rafale deal, calling it a scam that involves the security of the nation. The Congress MP and son of former Assam chief minister Tarun Gogoi alleged the Prime Minister upon his visit to France in April 2015 unilaterally decided to compromise with the security of the country by announcing emergency ‘off-the-shelf’ purchase of 36 Rafale aircrafts in Paris. He said neither the defence minister nor the defence secretary nor any cabinet meeting was called when the deal to buy the 36 Rafale aircrafts was made. No mandatory prior approval of ‘Cabinet Committee on Security’ was taken at the time of announcing purchase of 36 Rafale aircrafts on April 10, 2015, he said. Gaurav also stated that the mandatory requirement of ‘defense procurement procedure’ for ‘price discovery’ through the instrumentalities of ‘Contract Negotiation Committee’ and ‘Price Negotiation Committee’ was not followed by the PM. ‘Transfer of Technology’ to public sector undertaking Hindustan Aeronautics Limited for manufacture of Rafale aircrafts in India was also sacrificed by Modi, Gaurav alleged. “Rafale Scam is a copy book case of squandering ‘National Interests’, causing loss to public exchequer and promoting a culture of ‘Crony Capitalism’, at the cost of Public Sector Undertaking,” the MP said in a press statement after the press conference. “Art of deceiving India’ is the Modi Govt’s mantra in the biggest Defence deal of Independent India. Caught lying, Modi Govt is indulging in a brazen cover up exercise,” he said. He said purchase of 36 Rafale aircrafts at a cost of Rs 1670 crore per aircraft from Rs 526 crore inflicted a loss of Rs 41,205 crore public money. “Price of 126 Rafales as per international bid opened on December 12, 2012, during UPA-Congress govt. comes to ? 526.10 Cr per aircraft. 18 aircrafts were to come in ‘fly away’ condition from France and 108 aircrafts were to be made in India by Public Sector Undertaking, Hindustan Aeronautics Ltd. with ‘Transfer of Technology’. At this price, 36 aircrafts would have costed ?18,940 Cr,” he said. However, Gaurav said, Prime Minister Modi on April 10, 2015 announced emergency ‘off-the-shelf’ purchase of 36 Rafale aircrafts in Paris for Rs 1670.70 crore per aircraft, totaling Rs 60,145 crore for 36 aircrafts. “This price is apparent from ‘Annual Report, 2016’ of Dassault Aviation (Annexure A1) and from the press release of Reliance Defence Limited (Annexure A2),” the MP said. He asked will PM Modi explain why an extra amount of Rs 41,205 crore was is being paid from public money. He said the public has the right to know how the price has escalated as the money was public tax payers’ money. He stated that while the PM and the defence minister refuse to divulge the inflated price of 36 Rafale aircrafts claiming ‘secrecy clause’, the agreement between India and France has no such clause on non-disclosure of commercial purchase price. Gaurav added the Congress-UPA had disclosed the price of Dassault Aviation made MIRAGE aircraft, as also Sukhoi aircraft and other defence purchases on the floor of the Parliament. “What are the Prime Minister and the Defence Minister then hiding? Does the refusal to tell the price not reek of a ‘scam’?” he asked.